Even if a lawyer’s or firm’s conduct does not violate the ethical rules, the lawyer may still be disqualified if the conduct gives rise to an appearance of impropriety. Although many courts leave the standard undefined, courts generally ask, in short, whether the lawyer’s conduct causes “an appearance of impropriety . . . in the mind of an ‘ordinary knowledgeable citizen acquainted with the facts.’” Many jurisdictions have rejected the appearance of impropriety basis as outdated or vague (or both), but many more still use this basis for disqualification. The states essentially break into three categories: (1) the appearance of impropriety by itself can constitute the sole basis for disqualification; (2) the appearance of impropriety cannot constitute the sole basis for disqualification, but it can be a factor in considering whether to disqualify the lawyer; and (3) the appearance of impropriety cannot constitute the sole basis for disqualification or even a factor. There is a fourth category of states that have not decisively or clearly addressed the treatment of the appearance of impropriety in disqualification proceedings. Thus, the appearance of impropriety can constitute a basis triggering disqualification proceedings in many jurisdictions. [T]he appearance of impropriety can also be used as a factor when courts attempt to decide whether disqualification equitably is warranted in a particular case. Finally, the appearance of impropriety standard is related to a ubiquitously expressed standard of review: any doubts should be resolved in favor of disqualification. See, e.g., Ark. Valley State Bank v. Phillips, 171 P.3d 899, 909 (Okla. 2007) (quoting in part John W. Castles III & Laurie E. Foster, Conflicts and Lawyer Disqualification, Nat’l L.J., Feb. 6, 1984, at 16, col. 3) (noting that some courts have dropped the appearance of impropriety as a basis for disqualification “largely due to the fact that when the American Bar Association proposed the Model Rules of Professional Conduct, Rule 1.7 was drafted specifically to remove the appearance of impropriety test because the test was deemed ‘too vague’ and presented ‘severe problems’”); see generally Flamm at § 18.5 (discussing the history of the appearance of impropriety doctrine in disqualification cases and providing examples of states’ treatment of the standard). See, e.g., United States v. Dyess, 231 F. Supp. 2d 493, 498 (S.D. W. Va. 2002) (disqualifying entire prosecutor’s office in part because “[t]he allegations involve the personal and sexual relationship of an agent of the United States with a key ‘prosecuting’ witness who received lenient treatment as a Defendant when sentenced; alleged misallocation of substantial amounts of money; possible coerced testimony and perjury; and perhaps, other wrongdoings. Some personnel of the U.S. Attorney’s Office may have direct knowledge of these events, and all are charged with imputable knowledge. The general public would be hard pressed to avoid suspecting impropriety. In a matter as serious as this, even its appearance must be avoided”); City & Cnty. of Denver v. Cnty. Ct., 37 P.3d 453 (Colo. Ct. App. 2001) (disqualifying entire city attorney’s office solely because of the appearance of impropriety). . . .
 See, e.g., Gomez v. Super. Ct., 717 P.2d 902, 904 (Ariz. 1986) (noting that the appearance of impropriety “‘survives as a part of conflict of interest’” analysis in disqualification proceedings, but “it is ‘simply too slender a reed on which to rest a disqualification order except in the rarest of case’”); Sellers v. Super. Ct., 742 P.2d 292, 300 (Ariz. Ct. App. 1987) (quoting in part Bd. of Educ. v. Nyquist, 590 F.2d 1241, 1247 (2d Cir.1979)); Addam v. Super. Ct., 116 Cal. App. 4th 368, 369, 372, 10 Cal. Rptr. 3d 39, 40, 43 (Cal. Ct. App. 2004) (denying disqualification based solely on “a sibling relationship between a lawyer and the opposing party’s physician” and noting that the appearance of impropriety alone is insufficient to disqualify). Wade v. Nationwide Mut. Fire Ins. Co., 225 F. Supp. 2d 1323, 1331 (S.D. Ala. 2002) (“Both the ABA’s Model Rules of Professional Conduct and Alabama’s Rules of Professional Conduct, however, have since deleted their provisions concerning the appearance of impropriety in favor of the more precise rules governing client confidences, conflicts of interest and other matters. 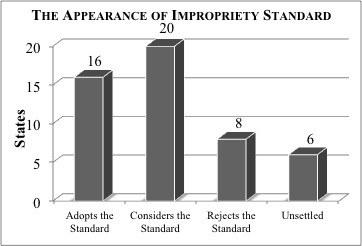 Thus, disqualification of counsel in this district can no longer be grounded on an appearance of impropriety.”); see [supra chart]. See, e.g., Kala v. Aluminum Smelting & Ref. Co., 688 N.E.2d 258, 266 (Ohio 1998) (“A very strict standard of proof must be applied to the rebuttal of this presumption of shared confidences, however, and any doubts as to the existence of an asserted conflict of interest must be resolved in favor of disqualification in order to dispel any appearance of impropriety.”). . . .